• Cook Cannelloni in boiling salted water just until pliable, about 7 minutes; drain. • Combine turkey, 1 cup Mozzarella, potatoes, milk, parsley, onion powder, and garlic powder. • Combine turkey gravy with carrots and peas. • Spread 1 cup gravy over bottom of an 8×8-inch baking dish. • Stuff each Cannelloni with heaping 1 TB spoon filling and arrange in dish. 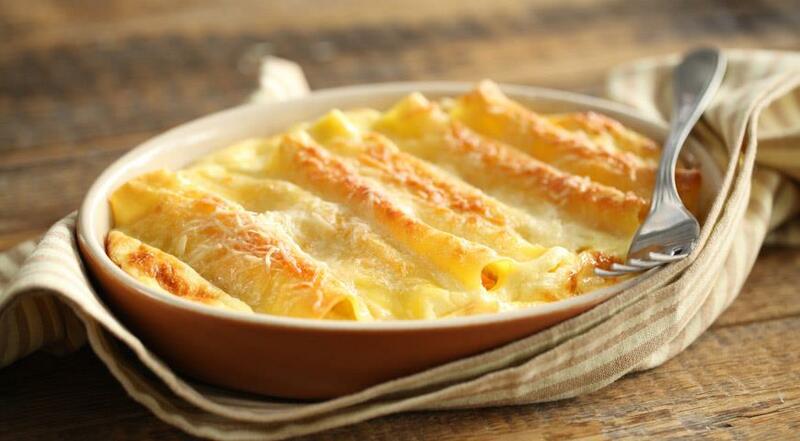 • Sprinkle 1/4 cup Mozzarella cheese over top of Cannelloni, then drizzle with remaining 3 cups gravy. • Bake Cannelloni until filling is hot, carrots are soft, and Mozzarella melts, 25-30 minutes.